Rated 5 stars and loved by thousands of users! 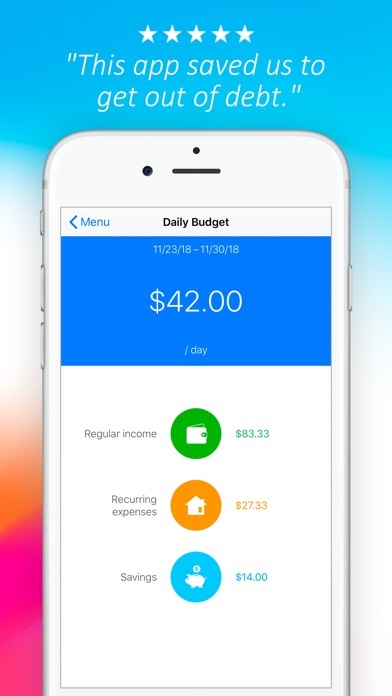 Unlike traditional complicated budgeting apps, Daily Budget Original focuses on being simple, easy and actually fun to use. This PRO version includes all paid features of the free version (yellow icon). -- SAFE & PRIVATE –- The app does not connect to bank accounts, so there is no need to enter your online banking log in data. Also, we do not sell user data. The data stays on your device only. If you want to sync your data, you can encrypt it before uploading it to the cloud. -- KEY FEATURES ARE FREE, FOREVER -- Many users are happy and saving a lot of money with the free version, without any additional paid features. Free features: Daily Budget calculation, planning & saving for big spending, basic categories for expenses, backup. Paid features: More and customizable categories, data encryption, PIN protection, Multi users via Dropbox, Remove ads, CSV file export, analysis graphs. -- USER REVIEWS –- Beyond spectacular! - This app is so fantastic- as with many other reviewers, I've tried other budgeting apps like Mint. But this is the only app that actually works. It incentives me to spend less money on some days, have extra to spend on the weekends. Thank you for not adding too many bells and whistles! Life Changing - I am the WORST with finances and I've tried other apps, including Mint, which I used for a week and quit. But this app?? It's amazing. I can't speak highly enough of how much this app is getting my life together. I'm aggressively saving, paying off all of my bills and I know exactly what I get to spend a day. I will never NOT use this. I hope it's here forever. 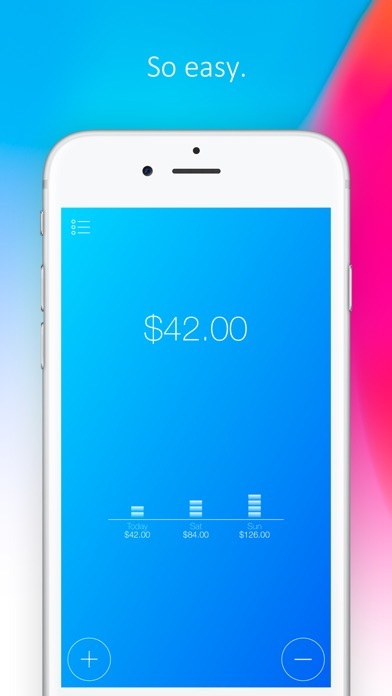 Helps you be Accountable - This app turns my financial life into a game that I feel I can win. 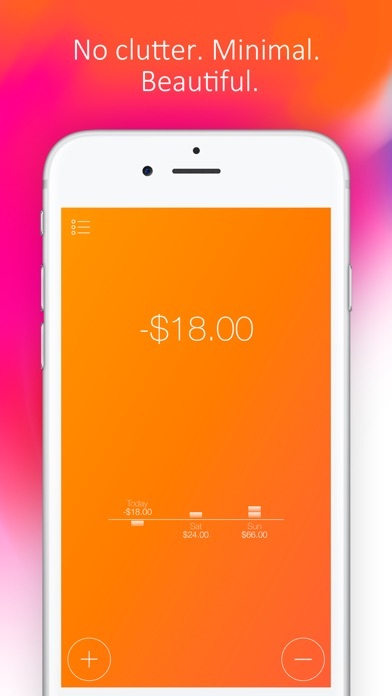 Daily Budget really works and it's core design sets it apart from other apps. -- IN MEDIA –- “Take the blah out of budgeting” – Seventeen Magazine “An utterly fantastic approach to saving” – Apppicker “Super-quick, easy way to show how well we're doing” - Appadvice -- HOW IT WORKS -- 1. Enter your regular income, like salary or monthly allowance. 2. Enter your recurring expenses, like rent or gym. 3. Enter your saving goal, like 10%. 4. Watch your Daily Budget gets calculated and know how much you can spend every day! *Daily Budget is calculated simply as: (Income – Expenses – Saving)/Number of days in a month. Watch your budget grow as you stay below your daily budget. Now, saving money is suddenly a fun game! This is what I really needed, as it gives me a goal to shoot for daily! I am not excited about this app. Should have tried the free version first. We’ve tried so many different money tracking apps & methods over the years (ynab, mint, mvelopes, pen & paper budgeting, cash only with physical envelopes etc)...none have worked as well for us as this one. Love the simplicity of it! There is something about having a bottom line number of how much we can spend (and a commitment to not spend more than that amount)...this app is making us think about our money in a totally different way. This app is not for someone who wants to micromanage their money (in theory you could with the app if you set it up that way though), but is definitely for you if you want an easy way to know how much you do or don’t have to spend. 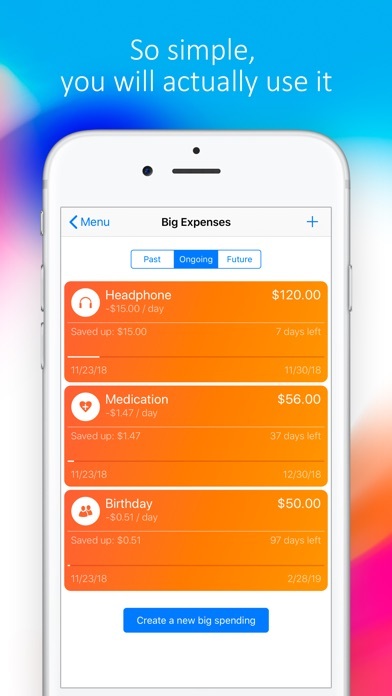 My husband & I have found a happy medium with this app (he’s the spreadsheet guy, I’m the one who struggles to track much of anything), he tracks our big bills with a written list, this tracks all else. Exactly what I needed to watch my expenses. Perfect simple way to track your expenses. I like that it isn't automatic like Mint or Personal Capital, even though I use PC - it doesn't let you get out of feeling every purchase. I don’t think I have ever written a review much less a lengthy one but this is an app I believe in and one that more people need to be using. This is the best, most effective budgeting app for me because it’s so easy to use. You simply enter your fixed income, fixed expenses, % of income you want to save and it tells how how much you can spend per day and still meet your savings goal. The bells and whistles of Moneywiz and Banktivity are nice for more detailed analysis but for daily use to simply track your spending this is what you need. Say you make $5000/month, have monthly bills of $2000/month and you want to save $500/month. 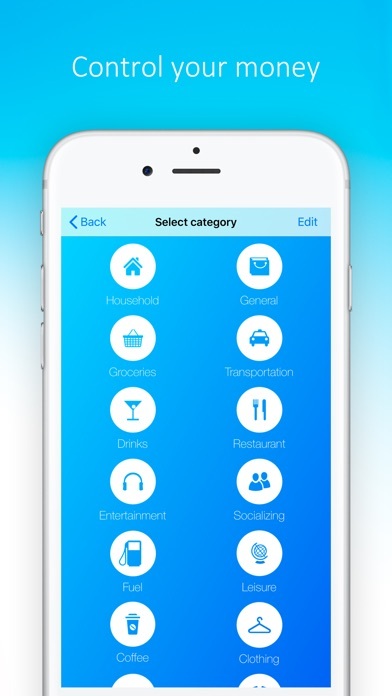 This app subtracts your expenses and savings from your income and divides whatever is left by 30 to give you your daily budget (5000-2000-500 = 2500/30 days = $83.33/day). Whenever you spend money you just open the app, hit the minus sign and enter it. If you spend $50 on groceries today then you have $33.33 left which carries over to your daily budget for the next day and so on. Hope this review helps but if not do yourself a favor and buy the app anyway. If you’re smart enough to look for something like this then you’re smart enough to use and benefit from this app. So simple - no fluff. Just works!